Our fourteenth walk is a continuation of the twelfth walk, starting at Tally Ho Business Park, in Burwood East, then walking to Glen Waverley and Vermont South. Catch the 75 tram (the longest tram route in Melbourne) and get off at Lakeside Drive (Stop 72, Melway map 62 C7). This walk is about 6km, plus 2km for the return bird- hide walk. From the tram stop, cross Burwood Highway to the south side, then enter Lakeside Drive, past the lovely little park and its picnic table near the “palms” and a small lake. At the bridge, continue downstream along a path that starts on the left-hand side then wends its way through this watery park. (If you come on a Sunday, it is hard to imagine that you are actually in a business park.) You will hear busy Springvale Road getting closer. 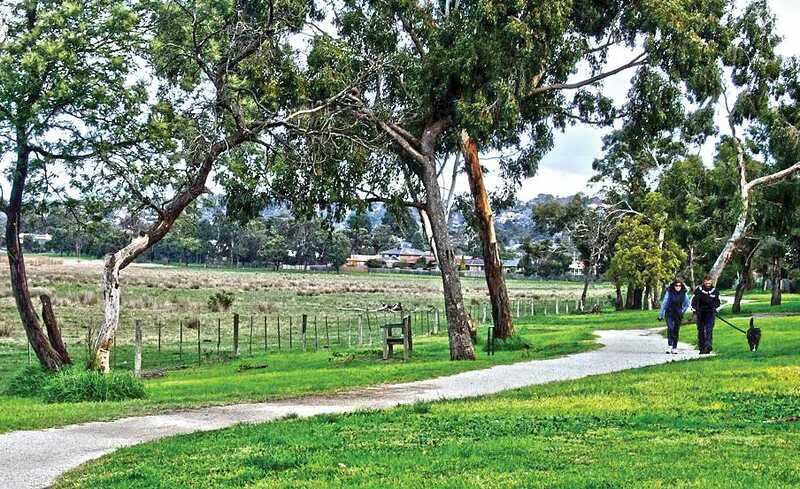 At the end of the lake, just past a landing near a green shed, walk up the grassy slope to Springvale Road, carefully crossing to the grassy sections in the median strip and opposite road verge, to Baranbali Drive (well signposted). Walk easterly along this street, which runs gently downhill, with fine views of the Dandenongs. This is very pleasant strolling, approaching an obvious park. Enter this park (Billabong Park, but I didn’t see any billabongs). Walk past the baseball ground towards the clubrooms, where you will see a flood retarding embankment that has a path heading east on top. There are some lovely old Australian trees here, and this short path finishes at Weeden Drive. Walk easterly along this gently undulating street for about 20 minutes, again a pleasant stroll. Look for views to the south of the Police Academy, and for several other hills to try and identify. On the corner of Narracan Street, look at the attractive bark on a large, old paperbark. When you reach the corner of Lascelle Drive (on the right), you will see a gravel path entering the smallish – but very attractive – Tyrol Park. The rustic wooden seat just over the rise is a good spot to take a break. How many sports can you practise here, do you think? This park also features many fine Australian trees. Walk diagonally across the park and exit by another gravel path that will come into view. On exiting, follow Akrana Court, then turn left into another street, cross Salsburg Court and find a short, concrete laneway (with new fences) on your left, which takes you to what becomes Bushy Creek Wetlands. Turn right (south) for 200 metres where there is a post-and-rail fence, Parks Victoria signage and a choice of two tracks (one to the south, one to the east). We can use both of them. The track to the south goes to the bird hide, well worth the half-hour return walk. Look out for (believe it or not) cattle, and their attendant egrets. Cattle have two roles in this park – they keep the fire risk down, and they provide part of the heritage story of the reserve. 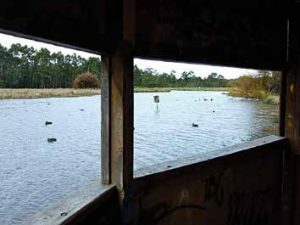 You probably won’t need binoculars at the bird hide – the ducks will come to you! Once back at the junction, take the track to the east. (There are a lot of tracks in this area, but you will reach the finish of the walk if you keep heading northerly.) This track passes a drinking-water tap, then crosses a small bridge. After the bridge it turns right, then at about 50 metres farther on take the left track, which climbs the hill. Where another track (on your left) joins this one a few minutes later, you will see a set of wooden steps ahead. Take these to the top of the hill, turn left, and walk around where until recently the lookout tower used to be. (Locals fervently hope that it will return soon.) You may also be interested to learn that this lovely, bushy “hill” is actually made up of garbage – it used to be a rubbish tip, which was very nicely rehabilitated. After less than 50 metres you will come to another gravel path. Turn left heading downhill, and after 100 metres you will come to another track (close to the current waste centre), but instead go down the set of wooden steps to your left. At the bottom of the steps, turn right and head for the small bridge (green poles and orange caps) leading into a small, attractively set playground. (From here, there are informal tracks to an entrance into Bunnings carpark, but they can be slippery.) The safe route to follow is to exit at the northwest corner of the playground into Mont Court, first westerly, then northerly to Burwood Highway. Turn right here and walk for about 50 metres to a bus stop between Officeworks and Bunnings. There is a cafe, and public toilets, in Bunnings. One day the 75 tram route will extend even farther to Knox Shopping Centre, but for now there is a frequent route 732 bus that goes right to the tram terminus outside Vermont South Shopping Centre, for our return to Burwood Village.